I seem to have a knack for tedium; the recipes or craft projects I want to make require either many steps or more effort each step. The higher amount of satisfaction is a most probable reason for these choices although I almost always feel sorry at half point. And then I will simply do it again. While browsing the latest issue of ‘Lust auf Genuss’, a photo of bright orange stars dusted with desiccated coconut wouldn’t leave my eye alone. I decided they have to appear on this year’s Christmas cookie table. Each year, my mother-in-law prepares a whole range of sweets for the Christmas period besauss we tend to stay home throughout and snack with only breaks made out of real meals. It’s high time I make a contribution too. 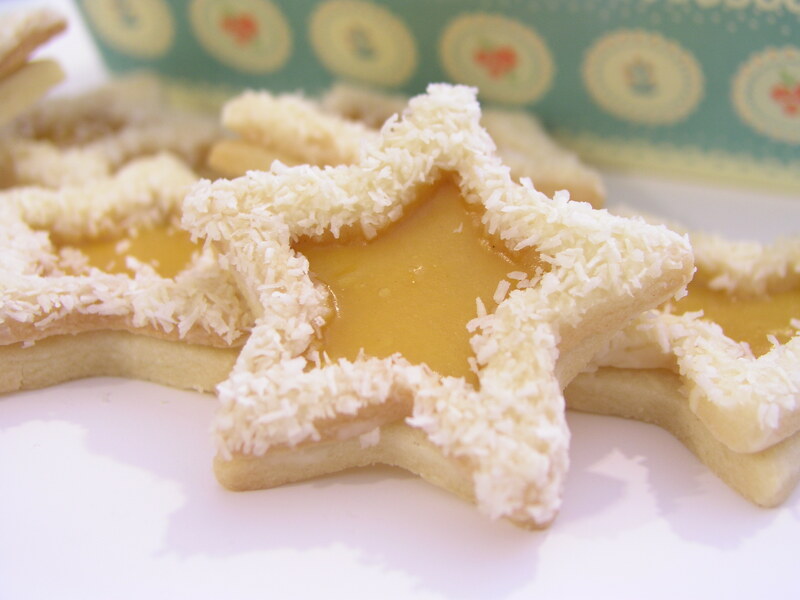 These coconut orange stars may look like Linzer cookies but are missing the almond part in the pastry. 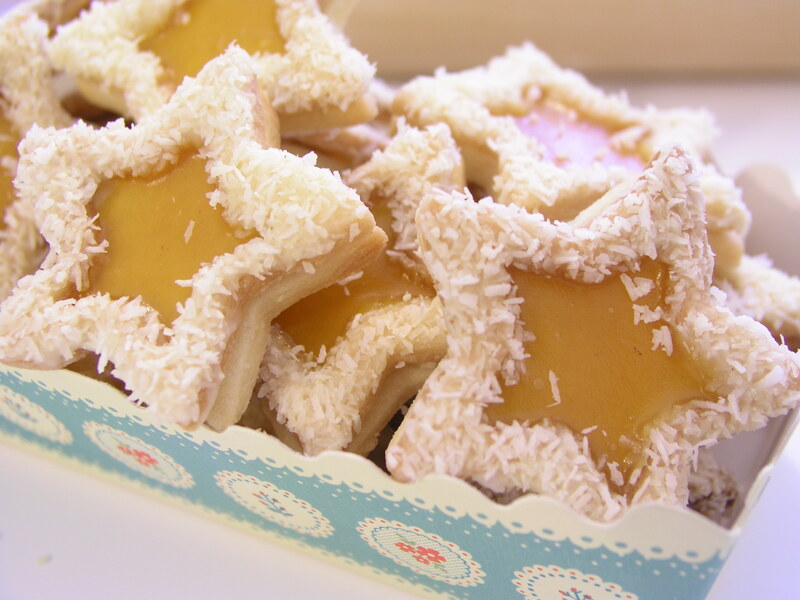 But one could of course use the Linzer cookie cutter readily available in German supermarkets for these stars. It punches an indent while cutting the shape in one step. Of course the intricacy factor would be reduced by half but if you are in a hurry, every tool counts. The assembling process would also be simplified. I made them for Christmas and they were very well-received. It was a pretty sight on the table. I thought these cookies would also be perfect for Chinese New Year with orange instead of pineapple being spiced for a change. Here comes another chance to bake them again soon! I’ve translated the recipe for those interested to try but don’t read German. The original is found in the December 2010 issue of Lust auf Genuss. * Cardamon seeds were not added because I’ve simply forgotten about them! **I wasn’t too convinced about the chili. ***Instead of canning sugar, I’ve used pectin because the only brand of canning sugar in the supermarket contains transfats. It’s unbelievable, isn’t it? The amount of pectin to be used depends on the brand you purchase. Read the accompanying instructions to know how much to use. Make the dough. Mix all dry ingredients well. Rub butter in and then add egg. Form dough into a ball, wrap it in clear foil and leave to rest in the fridge for at least an hour. Cut the stars. Preheat oven. Roll dough approximately 3mm thick and cut stars using a 6cm (in diameter) star cutter. Place stars on two separate baking trays. 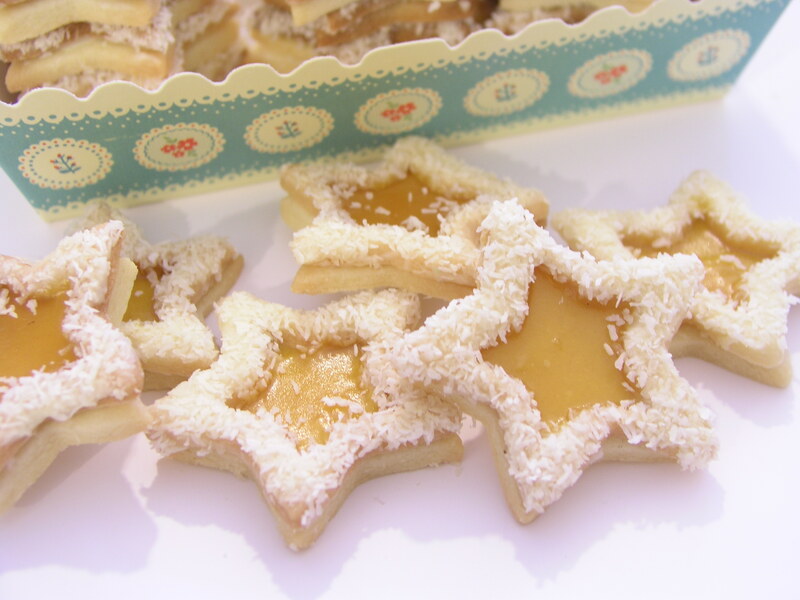 Using a smaller star cutter, punch out the center of the stars on one of the baking trays. Make sure you have an equal number of whole stars and star cutouts. Rest the stars in the fridge for about 15 mins before baking. Bake for 10-12 minutes until the cookies are golden brown. Leave to cool. Make the jelly. Soften gelatin in cold water. Place orange juice, lemon uice and spices in a saucepan. Boil mixture at medium heat until it’s reduced to 150ml. (That should take at least 5 minutes.) Remove spices. Add canning sugar/pectin. Cook for a further 3 minutes. Squeeze gelatin dry and add into hot mixture. Stir to mix well. Leave mixture to cool until it begins to gel. Assemble the cookies. Melt white couverture. Brush one side of the star cutouts with melted couverture and place them onto the whole stars. Make sure the edges are aligned. Rest stars until the two parts of the cookies are well bonded. Then brush the raised edges of the stars with couverture and dip them in dessicated coconut. Lastly, fill the indents with the orange jelly. Rest for at least a couple of hours for the jelly to set. If you use a linzer cookie cutter, you wouldn’t need as much white couverture. Make sure you gather whole stars and the star cutouts on separate baking trays. I baked a tray of mixed and the cutouts browned way before the stars. Use a water bath to melt couverture and keep the heat on low in order to have the right consistency of couverture for brushing throughout the process. Use a piping bag for filling jelly. It’s a lot faster and less messy.